Geologic has been drilling in various marine environments since its founding in 1987. While marine drilling requires more forethought and preparation than a typical land-based program, we value the op-portunity to work on these technically challenging programs. At the same time, we realize the increased risk while working on the water and enjoy a 25 year safety record of zero injuries, accidents or lost or damaged equipment on marine projects. This is not because we shy from a challenge. We routinely build custom structures for unique drilling requirements. From swiftwater platforms to work in the fast current of dam controlled rivers, to portable barges for work in level B respiratory environments, we enjoy working with our clients on technically challenging programs. We firmly believe in building strong relationships with the best marine partners in the industry. Whether it is for leasing specialized platforms, or having tugs on hand for safe, fast transport to a location or back to port, we believe that safety on the water is a matter of combining the right planning, equipment and experience. Geotechnical drilling from anchored barge in New Haven Harbor. Performed 8 borings between 90 - 125' below mudline in New Haven Harbor. 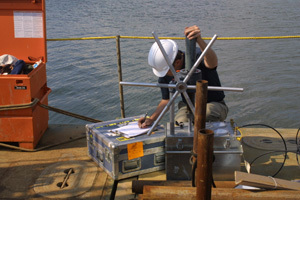 Performed pressure meter testing in bedrock borings in the river from Geo's Floating barge. Drilled land borings and performed test pits on land. Geotechnical exploration drilling in unusually deep sediments in an area of extreme current. 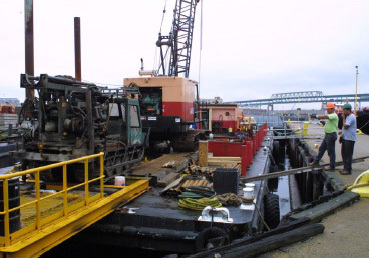 One of the most extensive Marine Geotechnical Drilling Projects performed in Rhode Island history. Program required drilling from land, a specialized barge, and custom modular concrete platforms with temporary personnel shelters, placed in the intertidal zone in areas of rough water and strong variable current. 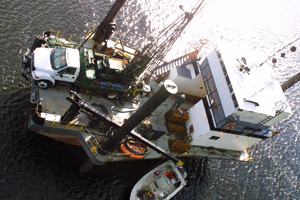 Geologic utilized a self propelled lift barge which would navigate to the location and lift itself out of the water to above the high tide line to allow work during otherwise difficult current and weather. Drilling on the barge was run in two 10 hour shifts to maximize utilization of the lift barge. Work was performed in areas of water depth exceeding 60 feet using telescoped cased borings to a bedrock depth of 370 feet beneath the mudline. Weighted drilling muds, varying in density and viscosity were employed to aid in handling hydraulic conditions during drilling and sampling. The lift barge setup was employed to work through gale force conditions in safety and security. The program was finished ahead of schedule and on budget. 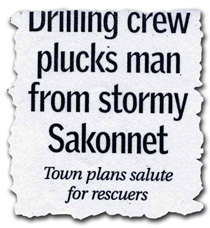 Three of the crew members were awarded Certificates of Heroism by the Town of Tiverton, Rhode Island for the late night rescue of a local fisherman during a gale.